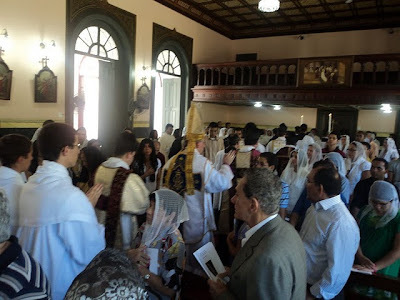 The following photos, which were published on the Portugese blog Christus Vincit, were sent in to us, coming from Azores, Portugual on the Feast of Our Lady of Guadalupe, and coming within the context of the Ordinary Form done ad orientem. No doubt, many readers will also take note of the use of blue vestments which is a permission granted to some parts of the Catholic world. Of the beliefs and practices whether generally accepted or publicly enjoined which are preserved in the Church some we possess derived from written teaching; others we have received delivered to us "in a mystery" by the tradition of the apostles; and both of these in relation to true religion have the same force. And these no one will gainsay—no one, at all events, who is even moderately versed in the institutions of the Church. For were we to attempt to reject such customs as have no written authority, on the ground that the importance they possess is small, we should unintentionally injure the Gospel in its very vitals; or, rather, should make our public definition a mere phrase and nothing more. 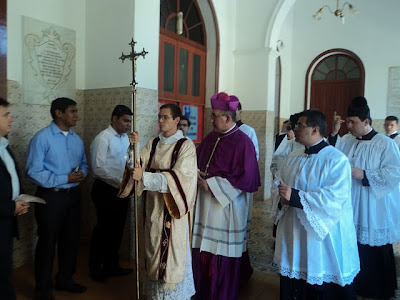 To take the first and most general example, who is thence who has taught us in writing to sign with the sign of the cross those who have trusted in the name of our Lord Jesus Christ? What writing has taught us to turn to the East at the prayer? 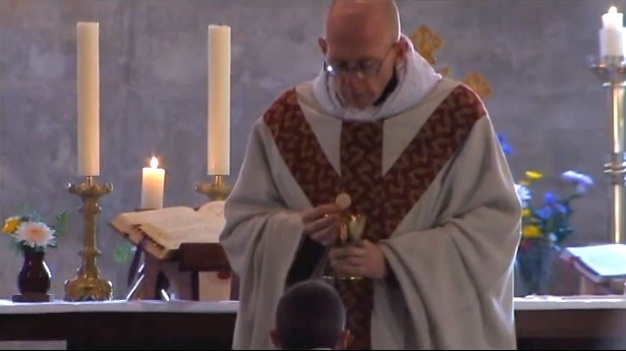 Which of the saints has left us in writing the words of the invocation at the displaying of the bread of the Eucharist and the cup of blessing? 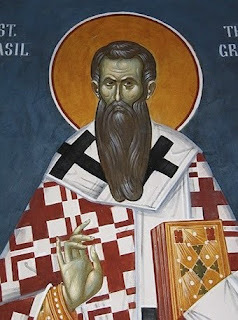 For we are not, as is well known, content with what the apostle or the Gospel has recorded, but both in preface and conclusion we add other words as being of great importance to the validity of the ministry, and these we derive from unwritten teaching. ... we all look to the East at our prayers, but few of us know that we are seeking our own old country, Paradise, which God planted in Eden in the East. On the 21st of August, Msgr. Andrew Wadsworth, the Executive Director of the ICEL Secretariat, delivered a keynote address to the Southeastern Liturgical Music Symposium in Atlanta, Georgia, on the topic of "Towards the Future – Singing the Mass." The NLM is very pleased to be able to present the address in full. In his address, Msgr. Wadsworth discusses "some of the implications of receiving the new translation of the Missal, with particular consideration of its possible impact on liturgical music." Maybe the greatest challenge that lies before us is the invitation once again to sing the Mass rather than merely to sing at Mass. This echoes the injunctions of the Council Fathers in the Constitution on the Sacred Liturgy and reflects our deeply held instinct that the majority of the texts contained in the Missal can and in many cases should be sung. 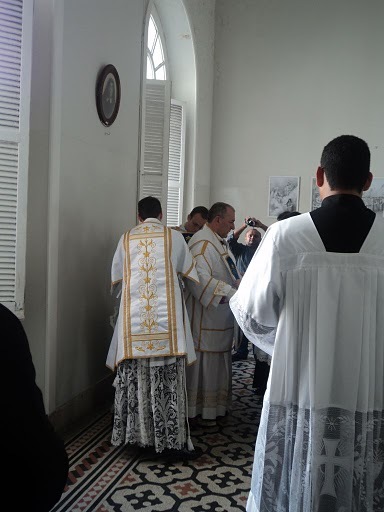 This means not only the congregational acclamations of the Order of Mass, but also the orations, the chants in response to the readings, the Eucharistic prayer and the antiphons which accompany the Entrance, the Offertory and the Communion processions. 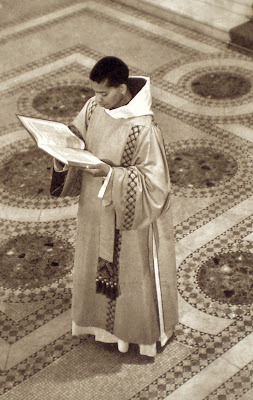 These proper texts are usually replaced by hymns or songs that have little relationship to the texts proposed by the Missal or the Graduale Romanum and as such a whole element of the liturgy of the day is lost or consigned to oblivion. For the most part, they exist only as spoken texts. We are much the poorer for this, as these texts (which are often either Scriptural or a gloss on the Biblical text) represent the Church’s own reading and meditation on the Scriptures. 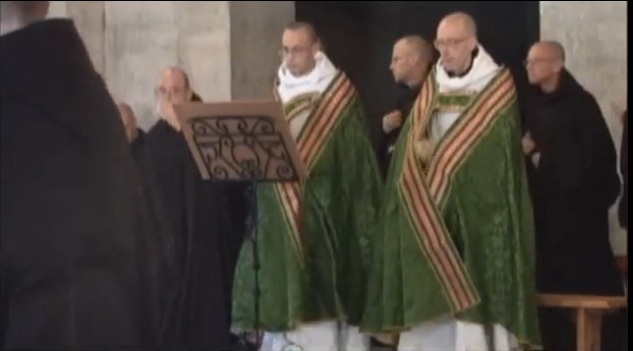 As chants, they are a sort of musical lectio divina pointing us towards the riches expressed in that day’s liturgy. For this reason, I believe that it is seriously deficient to consider that planning music for the liturgy ever begins with a blank sheet: there are texts given for every Mass in the Missal and these texts are intended for singing. 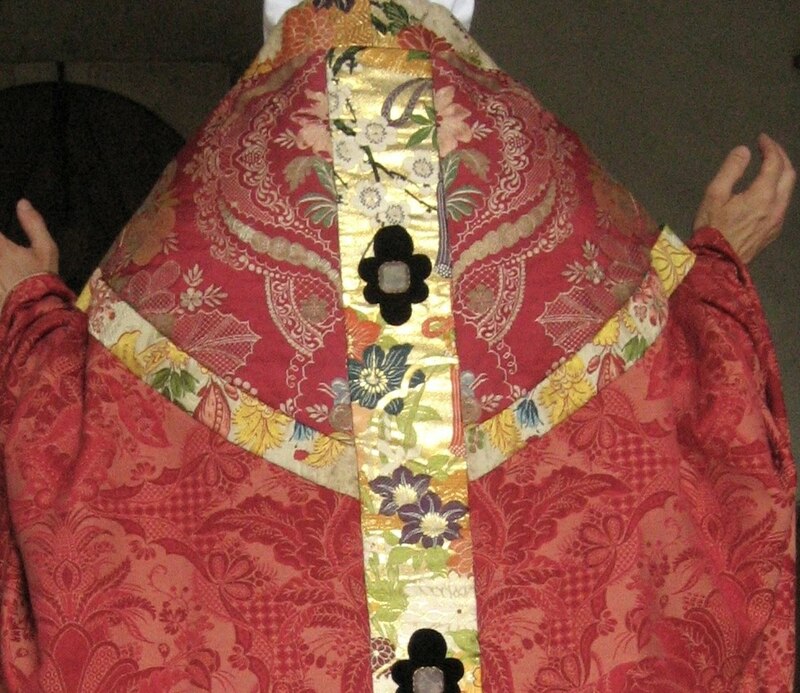 A while ago, we mentioned an upcoming publication by Ignatius Press, The Old Mass and the New: Explaining the Motu Proprio Summorum Pontificum of Pope Benedict XVI, by Bishop Marc Aillet of Bayonne, France, cf. NLM post here. Ignatius Press now has put online the preface to the book by Bishop Aillet. Here is a part of it; you can read the entire preface at this link. Benedict XVI has dared to do it. Announced as forthcoming for months, awaited by some with frantic impatience, dreaded by others with some anxiety, the motu proprio was finally published on July 7, 2007, with the title of Summorum Pontificum. It was accompanied by a personal letter from the Pope to the bishops, to explain the reasons for his decision. The press, whether ill-informed or ill-intentioned, denounced the victory of traditionalist pressure groups, considerably overestimating their influence on the Pope, who is said to be "conservative". It said nothing, on the other hand, about the pressure that may have been brought to bear on him to try to modify his decision: people had even brandished the politico-religious specter of the encouragement that would supposedly be given to the extreme right, since the sociological context of our country was so far beyond the insight of the Roman Curia. 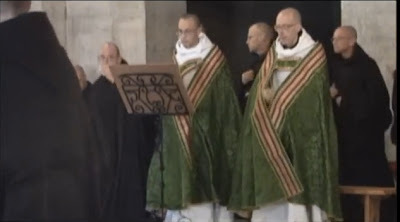 In any case, it was the first time in thirty years that some fear for the authority of the bishops where liturgy was concerned and that some objected to the risk of "subjectivism" in the way it was celebrated. And then it was necessary to reassure the directors of the reform, whose goodwill can rightly be acknowledged but who had been sent to work with so little liturgical formation. Some of you may recall some vestments which were shown here in June of 2009, which came from the first half of the twentieth century and were published in the French liturgical arts journal, L'Art de l'Eglise. 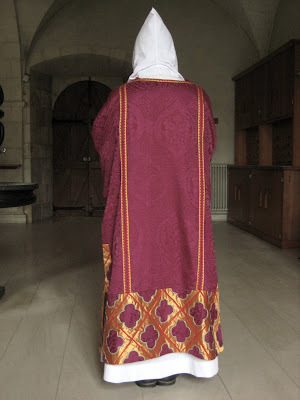 After posting these photos, one of our Benedictine readers wrote in to us to note that some of these were designed by a monk-artisan and architect, Dom Hans Van Der Laan, OSB, (1904 - 1991) of the Abbey of Oosterhout in the Netherlands. 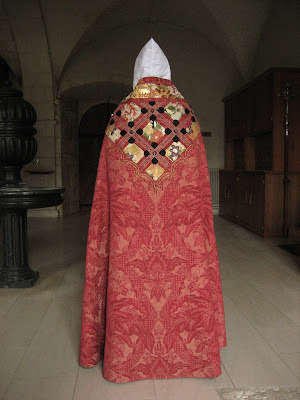 After this abbey closed, these vestments made their way to the French Abbey of Notre-Dame de Fontgombault -- which will need no introduction to most of our readers. 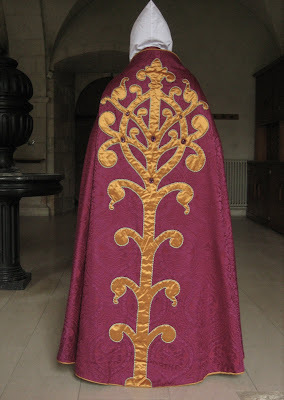 With the help of the Abbot of Fontgombault -- as well as Clear Creek Abbey -- I am very pleased to report to our readers that the NLM was able to secure current photographs of some of these vestments -- taken by the monks of Fontgombault, specifically for the NLM. 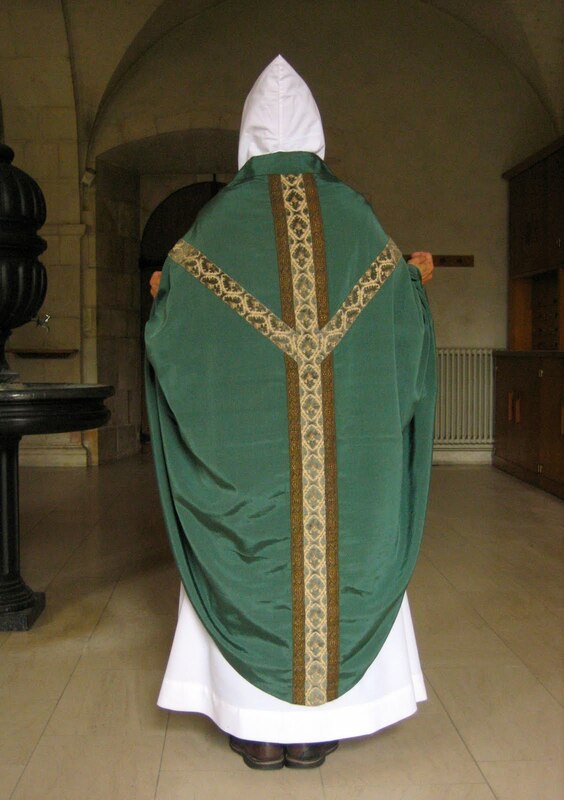 These vestments are interesting to consider from a few angles. First, as a reflection of one of the currents to be found in the Liturgical Movement, particularly within its more monastic context. 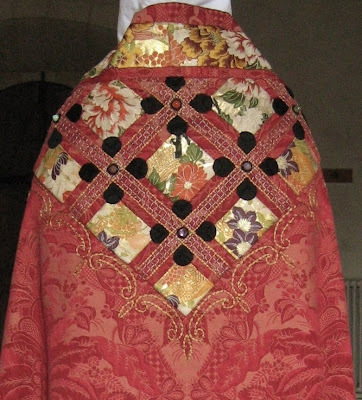 Second, in the case of the chasubles specifically, simply as examples of the conical form. Finally, there are also some "Other Modern" aspects to be found in this work which might be of inspiration to present day vestment makers who are seeking after ideas or examples where there is an attempt to marry the tradition with certain aspects of modernity. We begin with a red set which is, I think, quite stunning. 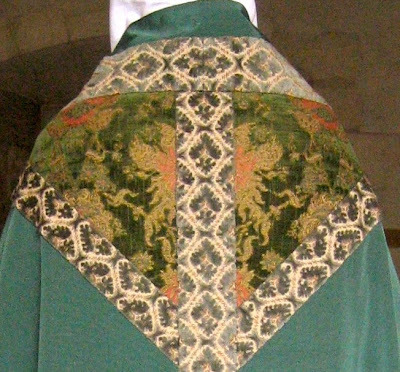 Here is a simpler green set of vestments. 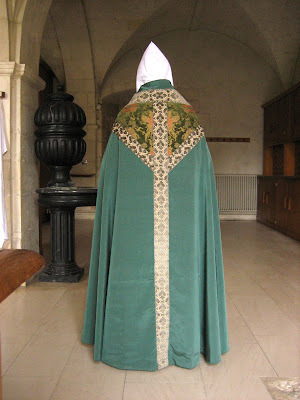 Typically, I have been somewhat resistant to non "hooded" copes, however, I believe both the red cope seen above, and the green cope below, do work rather well. 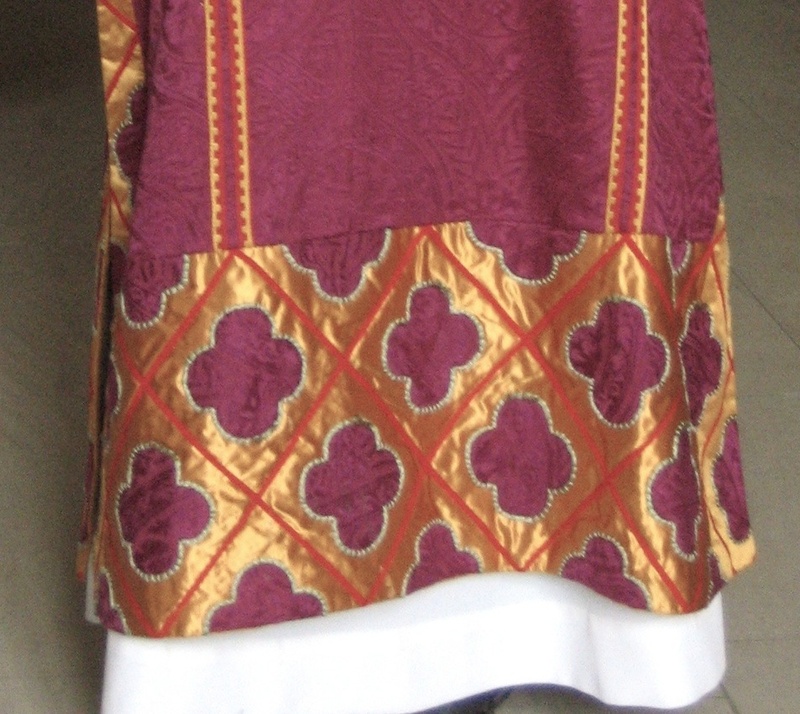 Finally, a violet set of vestments. The following details will highlight some of the materials and designs. The following is a detail from a set which I haven't shown. 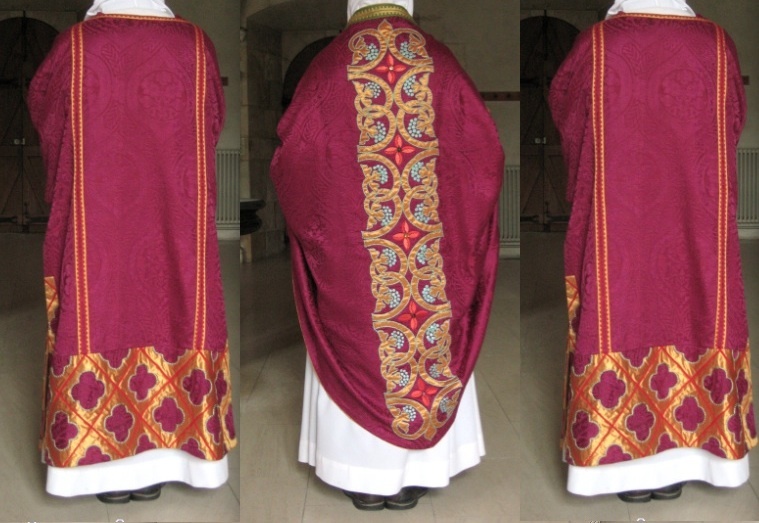 I thought it might be interesting to combine some of these photos to show what they would look like as Solemn Mass sets. 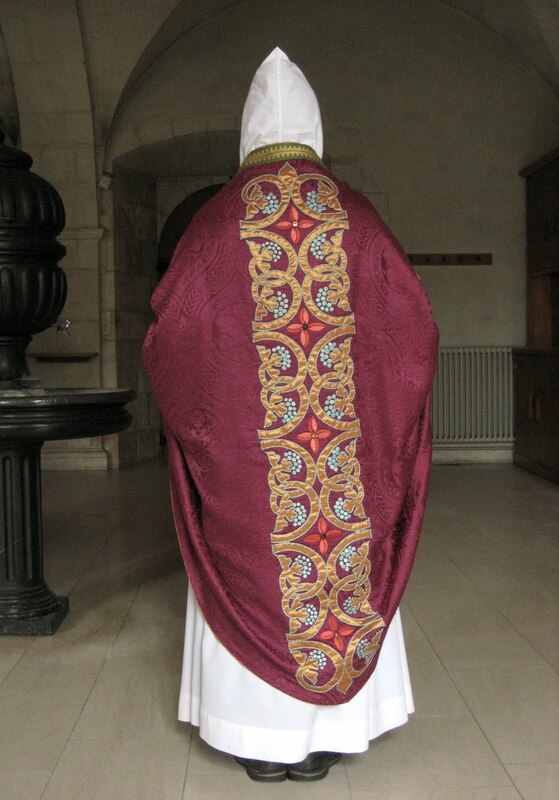 In the case of the violet vestments, it is difficult to tell whether they were intended as a part of the same set, but I will show it nonetheless. Thank you again to the Abbot and monks of Fontgombault and Clear Creek for helping the NLM to show these. 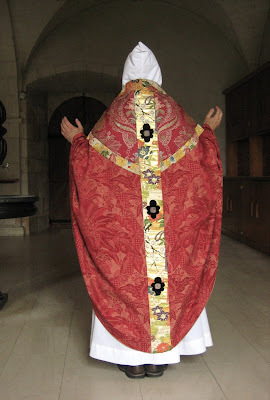 It is often interesting to consider the historical Liturgical Movement through the lens of its monastic versus non-monastic aspects -- with a concentration on the former and a view to how the former might be understood to have varied from the latter. This sort of distinction is something which was not entirely unknown within the historical Liturgical Movement itself. For example, in volume 115 of "The Twentieth Century Encyclopedia of Catholicism", which was dedicated to the subject of the Liturgical Movement and written by "The Sacerdotal Communities of Saint-Severin in Paris and Saint-Joseph of Nice" in 1964, we find a chapter which was dedicated to and tellingly titled, "The Merits and Limitations of the Monastic Liturgical Movement." In the light of the evident need to sift the trends and influences the 20th century Liturgical Movement -- for we saw some manifestations and principles which were very good indeed, while others were much less so -- this sort of distinction is a reminder that the monastic aspect of the Liturgical Movement -- particularly in the earlier decades of the Liturgical Movement -- is something which we should perhaps be paying closer, more conscientious attention to today, particularly as we move forward with the new liturgical movement of Pope Benedict XVI -- who I believe could be rightly called the "Father of the New Liturgical Movement." In essence then, I am speaking about a kind of "ressourcement", but as it specifically relates to the Liturgical Movement. This should be considered both historically and, further, as it might relate to our present day and circumstances, forming a part of the foundation for the new liturgical movement. 1. What were some of the monastic aspects, incarnations and principles to be found in the historical Liturgical Movement? 2. How might these sorts of principles apply in our own time and circumstances, helping to guide the new liturgical movement? 3. More generally, what role can (and should) monasticism play today within the context of the new liturgical movement given its particularly liturgical form of life? As part of this discussion, I believe it would be important for monastics themselves to contribute toward the answers to these questions. To that end, I wish to make a call for article proposals and submissions on such topics, first from monastics themselves, and second, from any and all. Submissions and proposals should be sent to stribe@newliturgicalmovement.org, preferably with a brief abstract of what you intend to research and write upon. 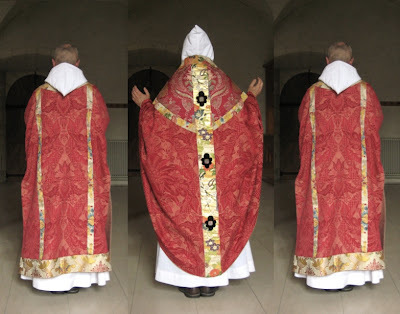 I do hope many will consider taking up this proposal, for I believe it could be a very pertinent point of consideration as we both look back on the Liturgical Movement, and look to the now that is the New Liturgical Movement. UPDATE: Regarding the series "The Biblical Story of the Mass" which we originally posted about on August 23rd, the NLM has been informed that this series is now actually beginning today, August 29th at 5:00pm EDT and not Sept. 5th as was originally planned. Accordingly, if you were hoping to watch the series, it begins today. I recently received this press release from EWTN and the series sounds both interesting and promising. One aspect which I certainly hope might come out strongly in the series is the typology to be found in Old Testament in relation to the Mass, including the matter of the Jewish Temple and Synagogue in relation to the Catholic liturgy -- in terms of both continuity and fulfillment. These aspects are indeed very powerful, both as an apologetic and also for our own understanding of the Mass; it can help us to understand precisely why the Church teaches us that the sacred liturgy is "source and summit". Irondale, AL (EWTN) – As a Catholic, do you ever wonder why Jesus is referred to as “the lamb of God” or why the “body and blood” of our Lord distributed at communion still look and taste like ordinary bread and wine? If the biblical story of the Mass did not begin at the Last Supper, where did it begin? Answers to these and many more questions will be provided in EWTN’s exclusive new 13-part series, “The Biblical Story of the Mass,” which will air 5 p.m. ET Sundays (with a re-air at 2:30 a.m. ET Fridays), beginning Sept. 5. If you really want to understand what’s happening at Mass, why the priest and people have distinct liturgical roles, why the Eucharist is the best path to a more personal relationship with Jesus Christ and the Trinity – and a whole lot more -- tune into this challenging new series. Hosted by EWTN Theologian Tom Nash and Fr. Wade Menezes, this lively, conversational program is partially based on Nash’s book, “Worthy is the Lamb: The Biblical Roots of the Mass,” http://bit.ly/dAqnPu. Nash is also co-author of “Catholic for a Reason III: Scripture and the Mystery of the Mass,” Fr. Wade Menezes is the well-known host of numerous EWTN series, including “The Ten Commandments of Catholic Family Life," and “Gospel of Life vs. Culture of Death”. Tune in this fall and learn what really happens on the altar each Sunday! The relationship between the tabernacle and the altar has, for the past two centuries, been one fraught with difficulties. The laity, particularly in America, frequently assume the elaborate wedding-cake altarpieces of the nineteenth century represent the fruits of some forgotten golden age; and indeed, they are not without their own charms, especially when compared with the Ikea modernism (and, unfortunately, occasionally Ikea classicism) that is the unique heritage of our own rather confused and cautious age. However, it is not without good reason that the rubricists of the Sacred Congregation of Rites and the enthusiasts of the twentieth-century Liturgical Movement, thought these highly interesting objects represented a sort of well-intentioned Eucharistic confusion. I do not say I agree with them per se, but read further. At least one author has called the church of the nineteenth century a Eucharistic presence chamber, and not a true place of sacrifice--the reredos with its enormous and frequently unrubrical tabernacle overwhealming the little Great Aunt Esther's-style sideboard altar, an impression not improved on by overwhelming and badly-deployed flower displays. This can seem a rather peevish and petty response to the presence of God on earth, and perhaps such complaints sprang from the lips of oversensitive aesthetes and theological hair-splitters. Certainly we have gone to the opposite extreme since the Council, banishing the presence of God on earth to tiny broom-closet cenacles and reducing beautiful hand-carved retablos to liturgical backdrops, but at the same time, there is much to be said for such critiques. To simply reuse lightly-adapted nineteenth-century forms of liturgical planning is to solve a newish problem by returning to an older one and avoid the heart of the matter. A number of old confusions have begun to re-surface, such as the claim that mass versus Deum is said thus so as to face the tabernacle. Mass is not an act of adoration of the Blessed Sacrament, but a propitiatory offering of It to the Father. (One is reminded of the strange habit of the Mariavite schismatics of requiring every mass to be coram Sanctissimo, which must have been very hard on the knees.) 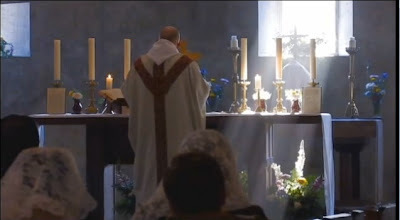 To claim otherwise reduces the unique beauty of Eucharistic adoration, Benediction, and our other acts of worship to Our Lord in the Host. There is room for both in our churches, but these theological distinctions are critical, lest the Trinitarian dimension of the Mass, and of Christ's role as mediator with the Father, be completely lost in the mind of the average Catholic. 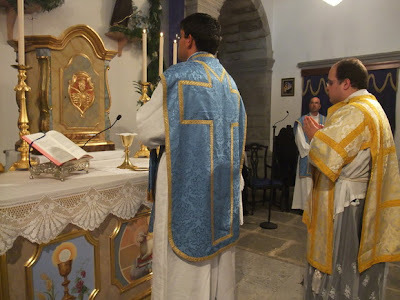 It is perfectly logical that we face the tabernacle during mass, of course, and it is the best solution to this complex liturgical issue, but historically it is not the sole or even principal reason for oriented worship. 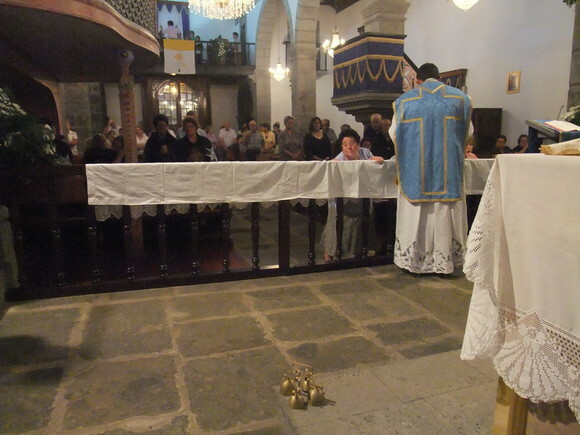 Confusion over this complex relationship is particularly evident in instances where a new freestanding altar is retained, while the tabernacle is returned to its original location on the high altar, or even under a baldachin. This places the altar and tabernacle in competition, or perhaps even makes the tabernacle the central focus of the church to the exclusion of the altar. 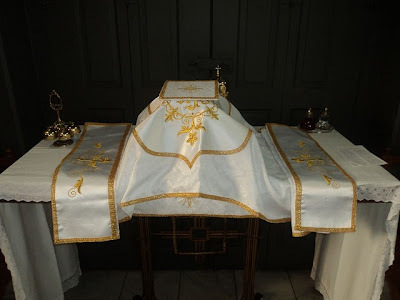 There is a reason, shortly before the Council, Pius XII thought it best that the tabernacle and altar ought not to be separated, precisely because it avoids this sort of quandary. I am by no means suggesting the tabernacle not be placed at the center and heart of our churches, but the altar must be placed there as well. The later Liturgical Movement often urged the removal of the tabernacle to some other place in the church to restore the primitive purity of the altar, but by separating the two it seems to have merely confused people both about the role of the altar and the theology of the Real Presence. The wisdom of the rubricians is evident here: the altar is important liturgically; the tabernacle contains the most important Person on earth. Rather than seek to choose between the two, they simply brought them both together. Church restorations must weigh this relationship carefully, while remembering most parishes will still demand a freestanding altar with the tabernacle behind, rather than upon it, for pastoral reasons. 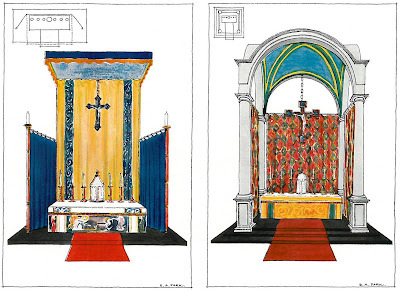 Some places will require a reredos behind a freestanding altar, which will be a natural place for the tabernacle. Some churches' sightlines absolutely demand it, and baldachins are comparatively more costly and can eat up valuable space in a small sanctuary. There is room for both ways in the Church. Indeed, I have designed one in the past (and seen it constructed) and I recently did some design work on another. 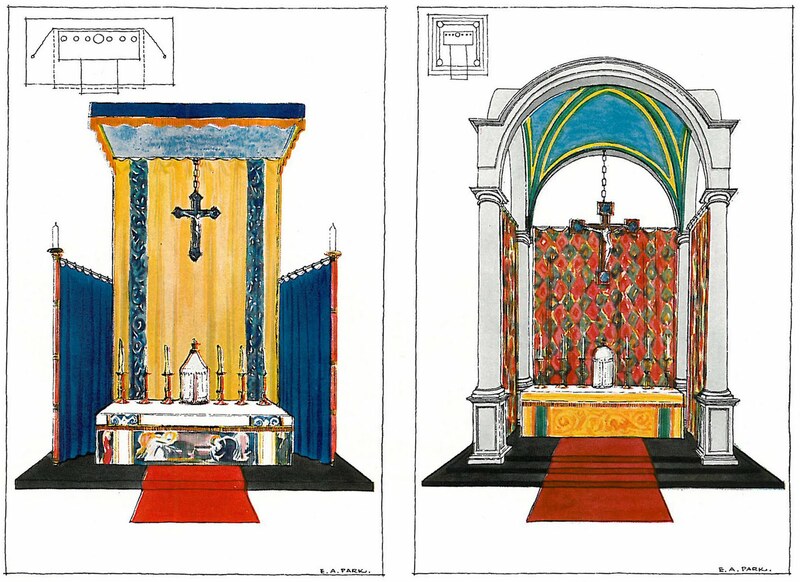 There are ways to reproduce the old relationship in spirit, by creating a careful visual relationship between altar and reredos, ensuring the two work together rather than competing; some of this can be achieved by carefully watching the way space, and most importantly, floor levels, are defined within the chancel. The eye must also be drawn to the altar as well, and not simply up and over it. Careful use of color may also allow the freestanding altar to stand out against the reredos while retaining an integral relationship with it. A simple hanging tester over the altar may also be one possible solution, perhaps the best one; the reredos behind can serve as a sort of conduit between the two elements, altar and canopy. This may be the most ideal arrangement in many re-renovated churches, though where possible, the baldachin ought to be encouraged. In modernistic open-plan designs, it may give a sense of dynamism to low, centralized sanctuaries. Clear mistakes, such as placing a tabernacle beneath a baldachin, and the altar some ways in front of it, rather lost and completely naked, should never be undertaken. I would much prefer a reredos as a tabernacle shrine with a freestanding altar than dump an altar in front of a gigantic baldachin covering only a tabernacle. As I said above, the wedding-cake catalog-bought reredos of most nineteenth-century churches has serious deficiencies from both a rubrical and theological perspective. First, most tabernacles of the period were not truly tabernacles, but sort of Eucharistic pigeonholes reminiscent of aumbries or sacrament-houses. Sometimes they may be the best choice for an interior, but a choice for them must be made knowing all the rubrical issues they bring up. 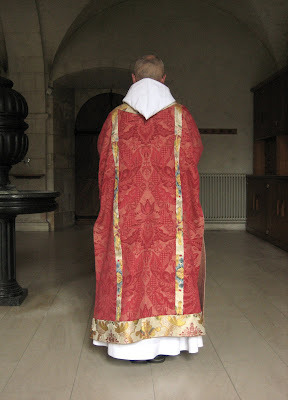 There is a place for both of these in the tradition of the Church, and I don't object to their re-use, as they are often rather charming, but they do not represent the pure, rubrical, Roman tabernacle. This is a freestanding object capable of being placed on an altar or gradine shelf, usually cylindrical, and capable of being veiled on all sides. The tabernacle ought not to have a permanent Benediction throne on top of it (though a temporary one was deemed appropriate), nor be used as the base of a statue. A crucifix is best placed behind it, in line with the altarpiece's six candlesticks. Such prescripts are no longer strictly-speaking required by law (in particular, the veil, which in some documents is considered optional though laudable; though there are some footnotes in the General Instruction that imply these practices have some degree of importance still) but nonetheless represent an important refinement of the tradition. Reredoses, of the proper shape and emphasis, are an ornament to any church, especially smaller ones that cannot afford a ciborium. Simply pushing an altar up against a wall, adding a crucifix, tabernacle, candlesticks and a sufficiently nice dossal can change a whitewashed barn into God's temple on earth. 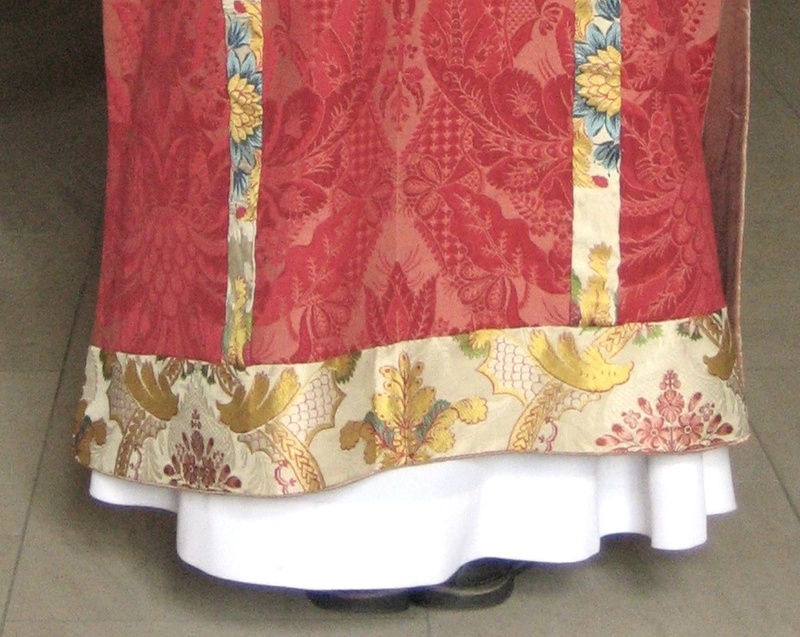 But for the time being, the freestanding altar under the ciborium (or hanging tester), with the tabernacle somewhere behind, remains the best possible arrangement in parishes where both liturgy versus Deum and versus populum are likely to remain the norm, lest we compound new mistakes with older difficulties. The following commentary appeared today in First Things written by Fr. George Rutler. I would in particular highlight his warning that, in seeking out solemn worship, one must also seek to avoid mere aestheticism. I would as well highlight his comment on the importance of ad orientem. The Liturgy by grace changes lives. Any pastor who is blessed with an abundance of priestly vocations in his parish knows that they come in spite of epicene worship, demotic liturgy committees, and flailing song leaders. 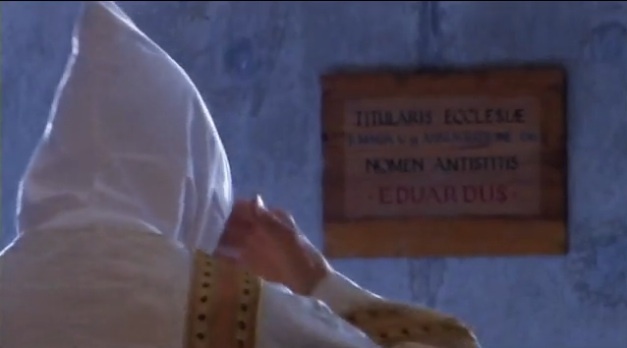 They simply join the chorus of the Greeks: "Sir, we would see Jesus." I recall a prelate saying that even as a seminarian he hoped one day to be able to say Mass facing the people. It was a revealing statement, inasmuch as when he said Mass he seemed annoyed that the Lord was sometimes getting in the way. I thought I would do a short series (I intend three at this stage) of articles focusing on paintings by the gothic artists, looking at two of my favourites Fra Angelico and Duccio. 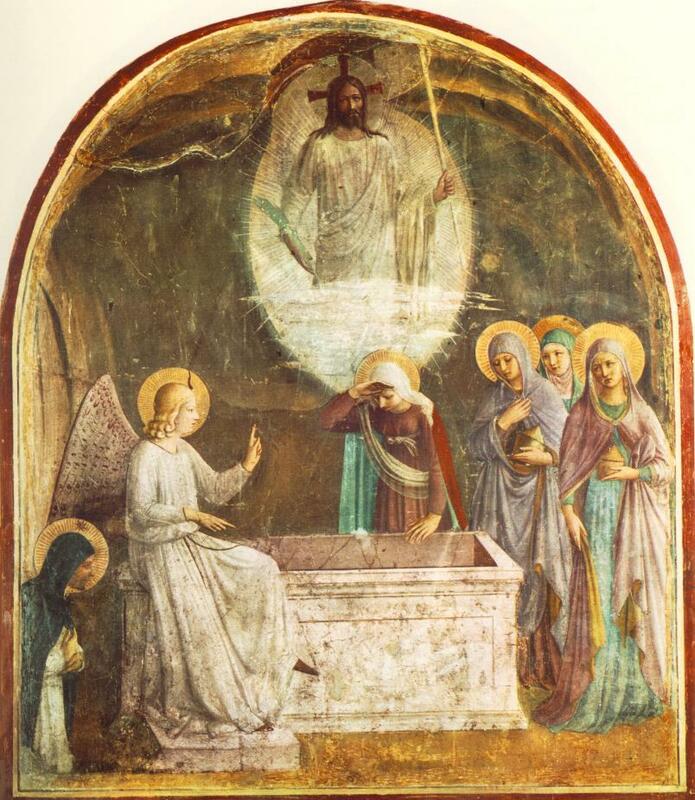 Fra Angelico, the 15th century Florentine artist is normally considered late gothic in style. Duccio, from Siena, worked earlier, in the late 13th and early 14th centuries. Duccio's work represents the more iconographic based style and Fra Angelic the more naturalistic. Looking at these two exemplars of early and late gothic art gives us a good sense of what characterises this tradition. This is not just for the purpose of an art history discussion. I think that there is much to benefit from artists today who are trying to spark the ‘new epiphany of beauty’ by looking at the gothic tradition. 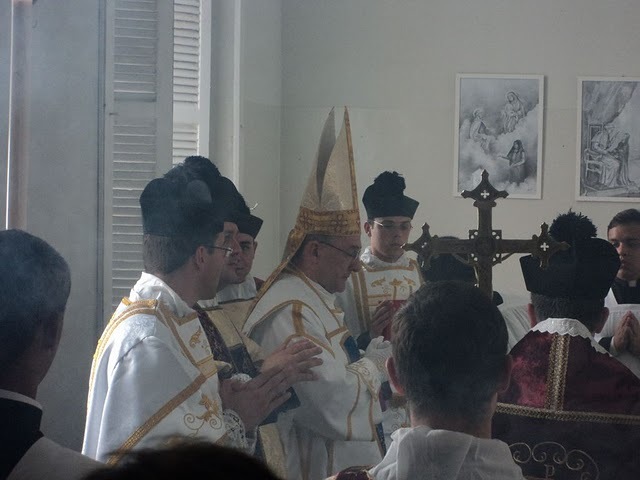 First, it is one of the three authentic Catholic liturgical traditions cited by Pope Benedict XVI in The Spirit of the Liturgy. Also, I often find in conversation that his work appeals to people who have a similar understanding of the Faith, the liturgy and Catholic culture as I do. It seems that for many, Fra Angelico in particular has the balance of naturalism and idealism that nourishes the prayer of modern man. John Paul II gave him a special mention in his Letter to Artists. I think therefore that perhaps this could be a good starting point for artists to study and from which a distinctive art of Vatican II could develop in the future (just as the baroque, which developed from the base of the stylistic developments of the High Renaissance, might be considered the art of the counter-Reformation and of the Council of Trent). Only time will tell if I am right in this regard, of course. As I wrote in an earlier article about his Annunciation, Fra Angelico working late in the period is very interesting to study for his selective use of the features of the well observed naturalism such as perspective, shadow and figures in profile; and his retention at other times of those features of iconographic art. 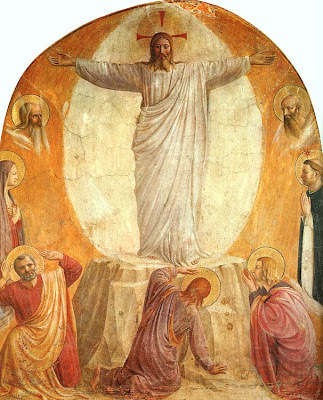 If we look his Resurrection a fresco from one of the cells in the monastery of San Marco in Florence, we see Christ rising in an almond shaped mandorla, the traditional symbol of His glory, carrying the red and white Resurrection penant. The background is shadowy and dark and we see the tomb drawn with naturalistic perspective. The angel is in profile, which would never be seen in an iconographic painting, though shining with uncreated light which one would expect. There is one stylistic feature that Fra Angelico uses that interests me greatly. This is his habit of putting the face of Christ in shadow. On first sight this is strange, since he shows the rest of the person of Christ shining with light and the face of the angel, a great, but nevertheless lesser being is totally in light. When I first noticed this I wondered why? A Dominican friar in England told me his interpretation of this: Fra Angelico is showing a light that is brighter still. In fact it is so bright that it blinds us - we are fallen human beings and when we behold him it is too much for us to bear. 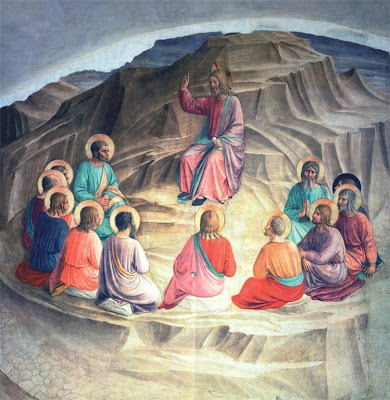 I find this explanation convincing, especially because we see in in other paintings by Fra Angelico, for example the Transfiguration and the Sermon on the Mount have the same feature. From a musician's point of view, putting together music for the EF is easy. Open the Liber and there you go. 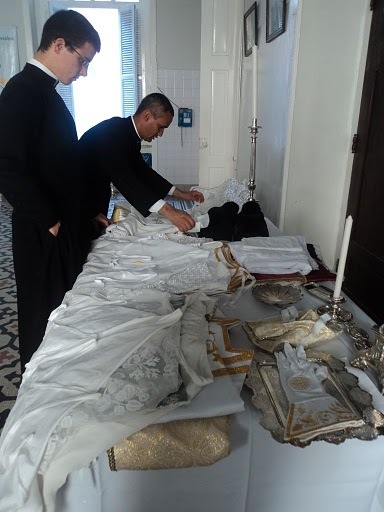 The most difficult thing to decide is a Mass setting, and sometimes, in the case of a Requiem Mass or a Mass for Sunday during Lent, even that choice is narrowed down for you. All of the music for the EF is prescribed. If you have a competent schola you can pull it off. If you have extra time you can sing a motet after communion. You are ready to sing the Mass and go home, have a nice meal and glass of wine, and enjoy the rest of your day. The ordinary form, on the other hand, is a different animal. It exists in a world riddled with mitigating circumstances. There are too many choices. If you've got the ideal in mind (Gregorian ordinary and propers, and maybe a motet or two), your troubles are just beginning. In some cases, ignorance (which I am not recommending here) can be bliss. But I digress. The EF works because all music and action is integrated. Different theaters act independently but overlap in the most beautiful way. The final product is a jewel whose facets glimmer and shine in different ways, and at different times on different days. But the OF is linear. Flow is important. One piece of music complementing another is also important. If you want a nice product that is accessible to parishioners (I assume that is why we are using the vernacular in most cases) and taps in to the eternal, an over arching view of the whole, keeping in mind all of the tiny parts, is essential. Let me give you an example that might help illustrate the dilemma: If I were a chef and owned my own restaurant, I would have the choice of what to put on the menu. I would know that I need some lunch offerings and dinner offerings. I would have lower-end lunches that were quick and delicious, and I would also offer more elegant fare for those business men and women who have more change in their pockets, or retirees with time to spare. Dinner would be similarly varied. I might offer a few chicken and vegan dishes - all artfully prepared of course, but with my customers' budgets in mind. I would probably also offer a filet and a series of imaginative specials that occur to me on any given day. Prices on these would vary. In the end I would hope that my restaurant would serve me - satisfy my creative urges and be a financial success, and the community - provide diners with an alternative enticing and palatable enough to draw them away from their own kitchens on a recurring basis. (Thanks for your patience. Now I'll talk about music at Mass again). If I am responsible for the music at an OF Mass, there are lots of things to take into consideration. Is it just a regular Sunday in Ordinary Time (think of this as a good dinner in my restaurant, not too fancy and affordable by all). I now have to make choices. I know what the ideal is, but my clientele, pardon me, my pastor and congregation, are not yet ready for all Gregorian chant. I don't want to alienate them or lose my job. I want to provide them with something in keeping with the norms of the Church yet worthy of the occasion. Do I chose a dignified hymn to start things off? Now I know I should chose a proper. That has always been the norm, even though we got away from it for a while. It's coming back, thank goodness. I suppose you know about this address given by Msgr. Wadsworth of ICEL at a conference in Atlanta just last week. But back to the matter at hand. Because I won't be doing all Latin quite yet (Here are where the mitigating circumstances I mentioned earlier come into play - parishioners and pastor not ready, missing schola members this coming Sunday, half of whom can't read chant, and I won't even tell you about the guitar problem I inherited when I took this job), do I chose a proper text in English set to a simple melody that all can sing? (We won't discuss here WHOSE job it is to sing the entrance, or Introit. I'll deal with that in another letter.) If so, which one? There are quite a few available these days. All free, too. So once I decide on the Introit (I'm going to call it that on a consistent basis so those around me quit calling it the gathering song), what do I do about the ordinary of the Mass? 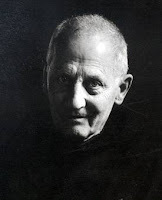 We're working on some chant when we can, and I'd rather not introduce the old post Vatican II standby (Mass XVIII - deadly dull and for good reason). Maybe we should just skip the Kyrie and make sure everything that needed to be said was included in the Penitential rite. Whew! On to the Gloria. I think I will choose Gloria XV. The congregation is getting the hang of that. So is Father; it really rocks. On to the Responsorial Psalm. (Wouldn't it be easy if I could just do the Gradual?) We just did Gloria XV, so I better lay off Latin for a while. Let me look and see what is posted for this Sunday at Jeff Ostrowski's Chabanel Psalm web site. I'll be sure to find something there that complements the Psalm tone Introit I chose and the chanted Gloria. I think I'll go with something in parts. I'll have 6 singers there this Sunday, and we can have two on each of the bottom parts. The soprano and alto are pretty strong, so we'll pull it off. The harmonic texture will be a nice change to the plainchant we've sung so far. And the English will be welcome. Does this give you an idea of the problems I am dealing with? The kinds of choices I have to face every week (and that's not taking into account weddings and funerals and other special days). Were that the OF as easy to put together as the EF. Before I close, I do want to thank you for what you have done so far. Thank you for reviewing what was going on at Mass in parish after parish around the world and making the ideals clear and spelling out what those are (in the best way you could at the time): Gregorian Chant and Renaissance Polyphony. But since the new translation of the Roman Missal was released last week, I thought this might be a good time for you to revisit some of the other things that have become fuzzy as a byproduct of your original revisions of the Mass. Since I am working in a parish that celebrates the ordinary form, with all of its mitigating circumstance, your firm guidance can't come soon enough. L'Osservatore Romano reported that the main speaker for this year's study weekend will be Archbishop Kurt Koch, the new president of the Pontifical Council for Promoting Christian Unity. The Swiss prelate will give two lectures, one on "Vatican II Between Tradition and Innovation" and another on "Sacrosanctum concilium" and the reform of the liturgy. I have often heard it said by parents and musicians generally, that whenever children are exposed to the Latin liturgical tradition -- and here I mean this in a literal linguistic sense -- inclusive of Gregorian chant, these same children are quite taken by it. 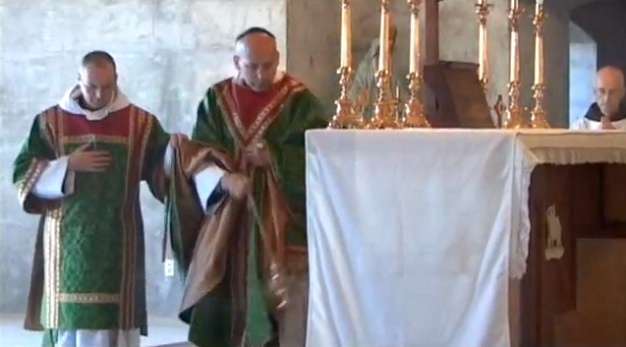 I was reminded of this when I received this video report from The Catholic Anchor wherein they report on a music camp at Holy Family Cathedral in Anchorage, Alaska, "in which young Catholics learned how to sing the music of the church, including Gregorian Chant. Children also heard from area priests about elements of the Mass and Catholic practices." The recording quality is a bit grainy unfortunately, but I think some of you will be interested in this presentation, given January 21st, 2010 by Dr. Brendan Grimes of the Dublin Institute, "Commodious Temples: Catholic Church Building in Nineteenth Century Dublin". Please note, this is not a video, but a Powerpoint style presentation. The presentation will take you through the various slides -- 41 in total. View more webinars from dubcilib. Many of our readers are interested in the sacred arts, and vestment design is certainly a major point of interest within that sphere. Accordingly, some of our readers will no doubt be interested to learn of the The Watts Book of Embroidery put out by Watts and co. of London. 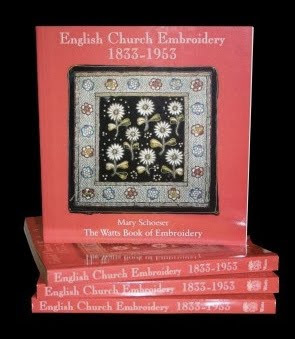 "The Watts Book of Embroidery is the first book devoted to the fascinating story of Victorian and Edwardian church needlework. Today remarkably little known, these embroideries document important aspects of nineteenth-century design by Pugin, Bodley, Morris, Kempe and others. 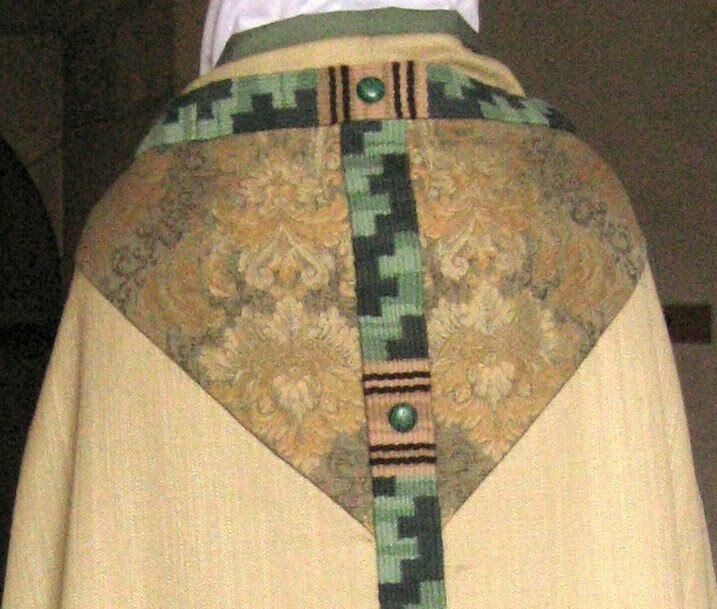 Their making also contributed towards a new style in the 1870s "Art Needlework“ as well as providing a training ground for women who later stitched for the Suffrage Movement. "The 200 illustrations, most especially commissioned for this book, show exquisite treasure from churches and convents throughout Britain." Just as a point of information, for those of you who were interested in the "Living the Liturgy" video from Clear Creek that we showed here earlier today, you can order a DVD of the same video from Clear Creek Abbey for only $12.00 USD -- payable by Paypal. The Diocese of Madison, Wisconsin presents A Treasure of Inestimable Value, a workshop to be held on October 1 -2, 2010. Renowned church musician and scholar, and priest of the Milwaukee Archdiocese, Fr. 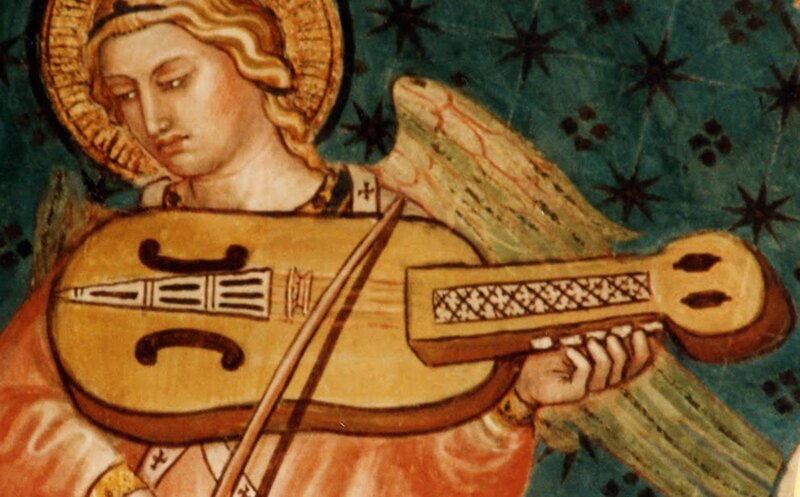 Robert A. Skeris, will speak about the history of Sacred Music on Friday afternoon (Oct.1) and on Saturday morning (Oct. 2) he will present a workshop on Gregorian chant. 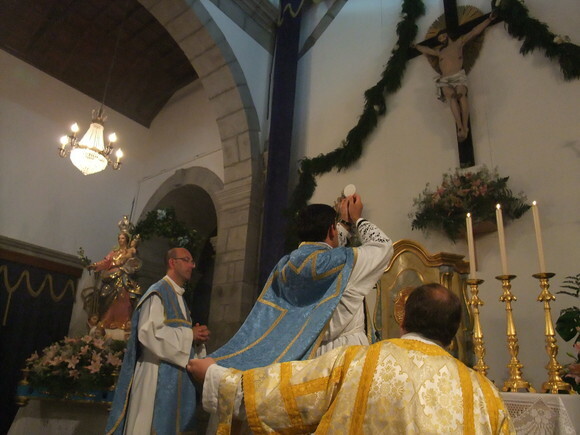 The Liturgy of the Hours and the Eucharist will be celebrated. We recently made mention of a video which was produced about the Benedictine Abbey of Fontgombault in France, and which aired on EWTN. 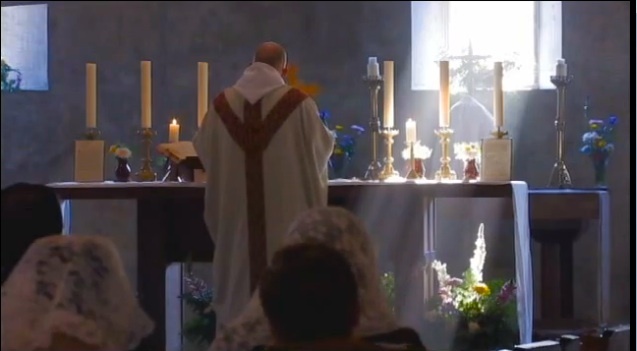 Now it has come to our attention that the following video, "Living the Liturgy: Clear Creek Monastery", has also been made available through EWTN, this time about the daughter-house of Fontgombault, Clear Creek Abbey in Oklahoma. We recently featured Sint-Agneskerk (St. Agnes Church) in Amsterdam as part of our Other Modern series, and in the course of arranging those photos, the NLM was informed by Jack Oosteveen, the Vice President of the International Federation Una Voce, and also member of the local "Foundation Ecclesia Dei" (Delft) of a Mass which was taking place which would see the Apostolic Nuncio, Mgr. F. Bacqué, in attendance. 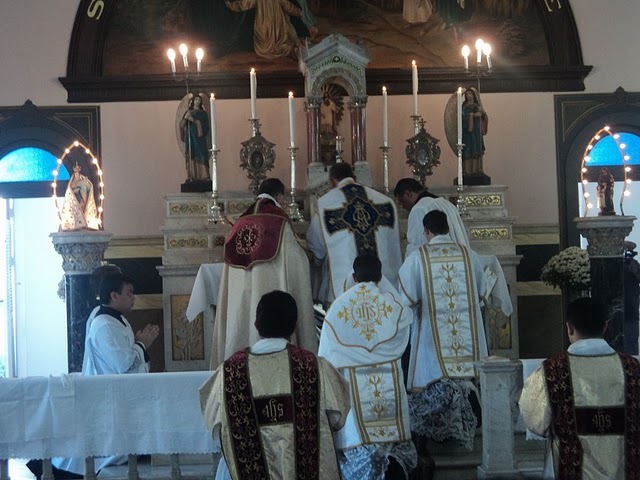 This Mass took place on August 15th, the Feast of the Assumption. Here are some photos of the event, which included a procession of a statue of the Virgin and Benediction of the Blessed Sacrament.